"In this era of mechanization and cultural disintegration, Moon calls us back to our source, our strength, our refuge: the earth from which we draw our very existence. From the strands of myth, folklore, symbolism, and her own personal stories, she weaves 52 essays that carry us through a year's worth of inspired journaling. She proves, beyond a doubt, that we can go home again, that we can reconnect with earth's sacredness, and that the journey is well worth the effort." 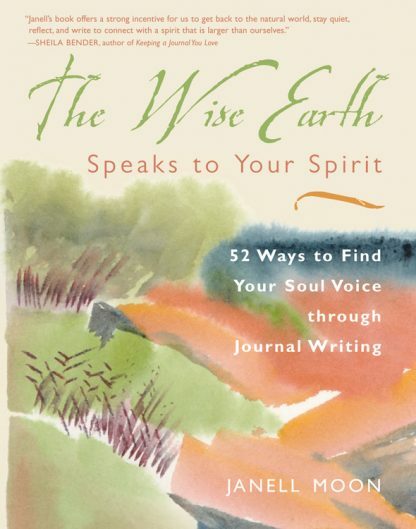 A heartfelt combination of spiritual discovery, environmental observations, and journal writing, The Wise Earth Speaks to Your Spirit offers readers a 52-week cycle of themed essays and related questions about the natural world. Entries on night and sky and parakeets, wind and mud and rain, snakes and tea and thistle, among others. In addition to folklore, myths, stories, and symbols connected to each theme, Janell Moon includes inspirational quotes from well-known writers -- among them E. B. White, Ursula K. LeGuin, Gertrude Stein, and Mother Theresa -- and shares her original poetry and personal experiences with the natural world. As she writes in the introduction, "It is my wish that through the telling of these stories, and the deepening of your own connections through your writing, that you will better enjoy a rainbow or a tree with angel's wings in a storm."